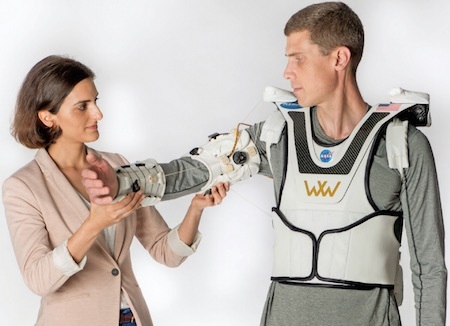 NASA has a new wearable technology that replaces, or strengthens, the human shoulder. Well, now NASA’s Wearable Robotics Laboratory, in collaboration with Rice University, has used the technologies developed for the exoskeleton and the Space Suit Roboglove to help with rehabilitation and augmentation of one of the most complex human joints … the shoulder. NASA’s Space Technology Mission Directorate supported the development of X1 and the Robo-glove through its Game Changing Development Program (GCD). GCD advances innovative technologies that have the potential to revolutionize future space missions as well as improve life on Earth. 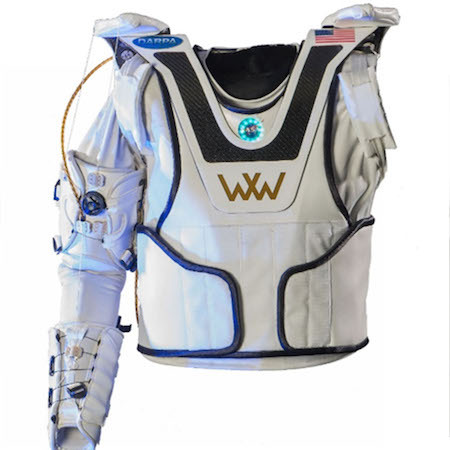 The Soft Wearable Upper Extremity Garment, or “Armstrong,” is worn on the upper body and can activate the shoulder and elbow joints using a Bowden cable transmission system. This system uses actuators on the torso to pull on synthetic tendons that cross the shoulder and elbow joints to create the desired movements. Integrating this technology could provide a means to augment astronauts during planetary EVAs, easing difficult manual lifting and manipulation tasks. Armstrong was developed for Warrior Web, a DARPA program looking, in part, to advance technologies to prevent, reduce, and rehabilitate soldiers with neuromusculoskeletal injuries. DARPA’s aim is to help soldiers who have had a Traumatic Brain Injury (TBI), which often causes motor impairment and limb weakness similar to a stroke. "We'll just block off all sensation from your shoulder on . . . there, that didn't really hurt. This? Oh, it's a local venial and arterial constrictant; we want to keep things clean. Now, we'll just cut you along the—well, if it upsets you, don't look. Talk to your friend there. It'll just take a few minutes. Oh, that must have tickled all down in your tummy! Never mind. Just once more. Fine. That's your shoulder joint. I know; your arm does look sort of funny hanging there without it. We'll just stick in this transparent platisplasm cage now. Exact same articulation as your shoulder joint, and it holds your muscles out of the way. See, it's got grooves for your arteries...."